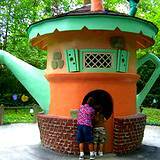 Bring your children to StoryBook Forest at Idlewild Park and experience the land of storybook imagination. Here you will literally walk through one classic children's story after another. Watch your children's face light up when you visit The Little Old Lady That Lives In A Shoe, you know, she had so many children, she didn't know what to do. You can usually find her sitting in her rocking chair knitting something for her children. Children love sitting at her feet as she tells them stories. Live characters will welcome and entertain your children with the magic of walking through a wonderland of classic storybook villages. 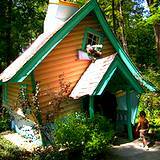 Visit the home of Peter Peter Pumkin Eater, The Three Little Pigs, Humpty Dumpty and The Little Crooked Man. 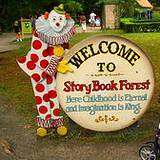 It's so much fun to travel through StoryBook Forest and become an interactive part of all these classic stories that have brought entertainment to many generations. Idlewild Park, also known as the most beautiful theme park in the United States, is a family friendly Pennsylvania Amusement Park that will charm you with unique attractions that a family can afford to visit, eat and buy souvenirs without maxing your budget or credit card. 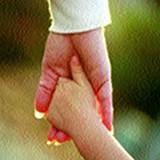 You'll find yourself reciting nursery rhymes and humming along to the many classic songs as you hold your child's hand and walk through the StoryBook Forest Village and browsing through houses, pumpkins, shoes and keyholes. When you visit a place like Storybook Forest you're only limited by your imagination. The dreams of the creators of this magical storybook village, C.C. McDonald and Arthur Jennings became reality in 1956. 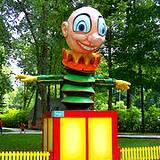 McDonald was once the owner of Idlewild Park and Jennings was a performing clown. Together they built a beautiful StoryBook Forest for generations of children's classic book lovers to enjoy their favorite stories while interacting with their favorite characters. 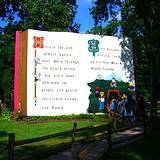 StoryBook Forest at Idlewild Park is a beautiful start to your vacation. 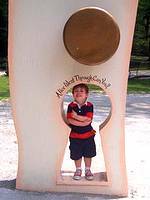 As you travel through the Allegheny Mountains you'll notice many roadside attractions. Take your time and visit our PA State Parks and other unique Pennsylvania Amusement Parks. You'll find small communities with Pennsylvania Festivals and Annual Events that will tempt you to lose track of time. Take your time and tour Central Pennsylvania you may be surprised at how the communities will make you feel welcome and right at home. From Pittsburgh: 50 miles - Route 376 Parkway East to the PA Turnpike to Exit #67 Irwin. East on Route 30 to Ligonier. From Altoona: 60 miles - Route 220 South, Route 22 West, Route 219 South. West on Route 30 to Ligonier. From Wheeling: 90 miles - East on Interstate 70, Route 119 North. East on Route 30 to Ligonier. From Morgantown: 90 miles - North on Route 119. East on Route 30 to Ligonier. From Cumberland: 70 miles - Route 220 North, West on PA Turnpike to Exit #91 Donegal. Route 711 North. West on Route 30 to Ligonier.